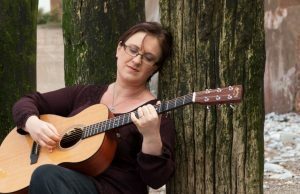 Nominated at the 2015 BBC Radio 2 Folk Awards and celebrated by The Telegraph as “one of Britain’s top folk musicians” Ange Hardy has grabbed the attention of the traditional folk music world by writing new material and embracing modern technologies whilst maintaining a traditional feel. Alongside a staggering list of other accolades Ange was awarded FATEA Magazine’s “Female Vocalist of the Year” in 2013, “Album of the Year” in 2014 and “The Tradition Award” in 2015. Her rapid rise in the folk world began when her 2013 debut folk album Bare Foot Folk was played on BBC Radio 2 and gained the attention of veteran folk broadcaster Mike Harding, her 2014 album The Lament of The Black Sheep subsequentlyreceived 5-stars from The Telegraph which led to Arts Council England funding her 2015 album Esteesee – an album of music based on the life and work of Samuel Taylor Coleridge.Ange’s 2016 album Findings with Lukas Drinkwater was launched during a live session on the BBC Radio 2 Folk Show, and was toured nationally at venues including The Sage Gateshead and The Regal Theatre. Findings hit Number 1 in the Amazon Folk Music charts, received 5-star reviews from R2 Magazine and found itself in the fRoots Critics Poll end of year list.